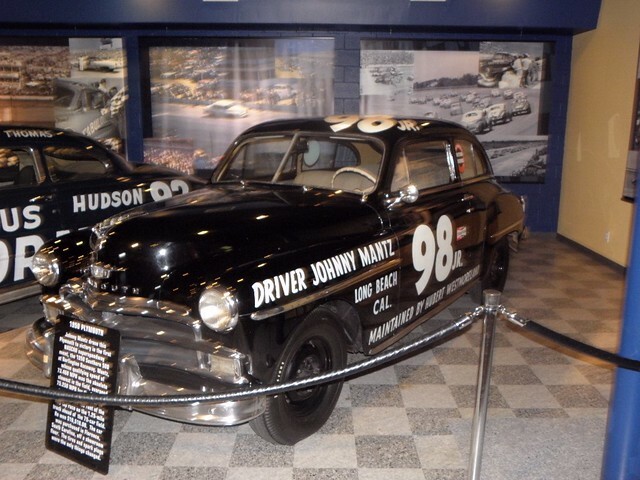 As I may have mentioned yesterday, a lie-in was permitted this morning as the Darlington Raceway Museum doesn't open until ten ack emma, plus it was a comparatively short drive down to Savannah afterwards - only 175 miles. Prior to departure there was some mild panicking when a series of e-mails concerning my hotel booking for tonight said there was something amiss with my credit card. I decided to turn up there anyway and see what happened. I was first into the museum when it opened, and a massive two others punters appeared while I was there. 'tis not very big, containing as it does only about a dozen cars (one of which is a wreck), so it doesn't take long to see them all. But there's also a shedload of interesting photographs, trophies, a case full of attempts to circumvent the rules1 and the National Motoring Press Association Hall of Fame. You could quite easily spend most of the day here, pressing the little red button under each of the NASCAR luminary's portraits and listening to the potted summary of why they are famous, but while today was a lazy day, it wasn't that lazy. 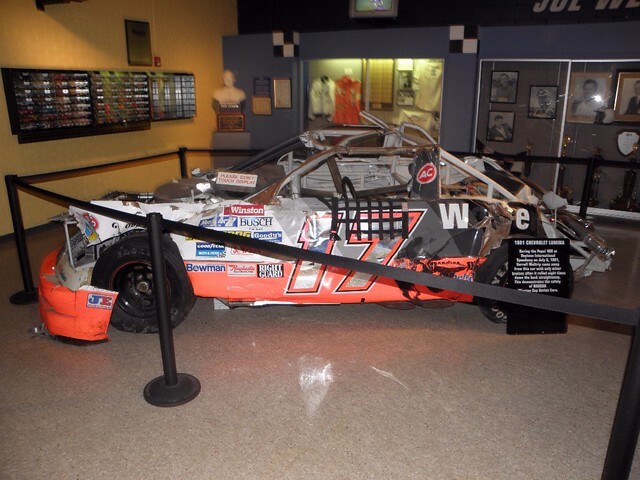 The mortal remains of Darrell Waltrip's Chevrolet Lumina following a 200 mph crash at Daytona in 1991. He escaped with only minor injuries. I went back into Florence briefly as I needed fags and ice-melting equipment. The bloke running the ice-melting equipment shop has a cousin living in Surrey. And then onto I-95 south. I-95 in this area is mostly surfaced with the kind of vile bumpy concrete much favoured by Mr. A. Hitler, which is now out of fashion in civilised countries. They've even gotten rid of the last stretches of the stuff on the M11. Flat and surrounded by pines again. 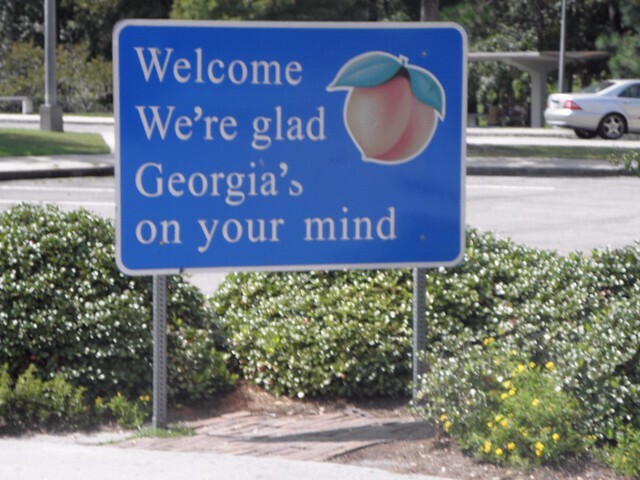 I was tickled by one roadside billboard, for an outfit selling "peach products, pecans and propane". It was almost as if some strange local ordinance allowed businesses to sell only products beginning with the same letter of the alphabet. Not much different scenically until you run into Savannah which, as with most cities of any size over here, is surrounded by miles of used car dealers, pawn shops, fast food joints and "gas" stations. I'm actually in Garden City, which fits the above description pretty well but the hotel is nice, as well as being half the price of those in the city centre. It would have been nice to be able to stroll around the Historic District, but my feet are not really feeling up to strolling and I rather fear that this may be the case for quite some time. Savannah hav a v. interesting history if you are interested in hist. which few boys are. For some reason which I can no longer remember, it didn't get trashed in the Civil War, unlike much of the rest of the south. If you're interested, look it up on Wikinaccurate. It was also the site of the first United States Grand Prix, only with typical colonial disregard for the niceties, it was called the "Grand Prize". This was held in 1908 and was won by Frenchman Louis Wagner in a Fiat. Savannah is also a major container port and, at this time of the year, is hot and sticky. Check-in time at the hotel wasn't until three pm, so I drove through the city and out the other side, heading east across the myriad creeks and salt marshes which lie between Savannah and the sea. 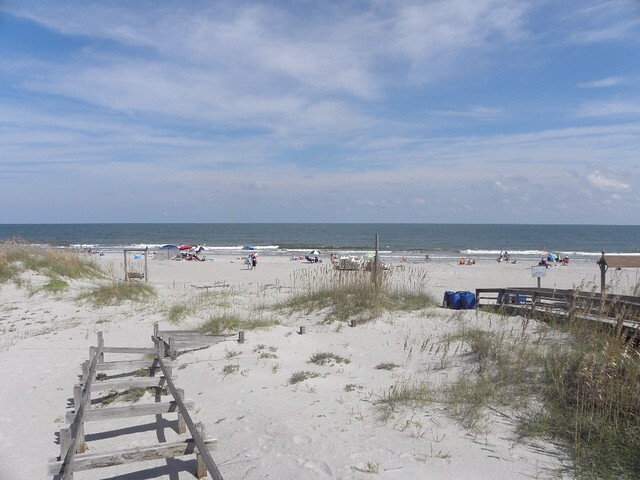 At Tybee Beach I ran out of America and had to turn round. Back to the hotel where the credit card nonse was quickly sorted out. It seemed I had entered an incorrect expiry date. Fool. Tomorrow should be an even lazier day. My flight isn't until 21:20, the motor-car is due back at 19:00, check-out time here is 11:00 and Atlanta airport is fewer than 250 miles of freeway distant. I shall have to consult Thee Map to see if there's anything interesting within range. Next update may be a while in coming as I am given to understand that the stingy cockwombles at Hartfield-Jackson charge for the use of their Wi-Fi. Welcome to Atlanta, now show us the money. I think not. 1 - They missed possibly the best one evvah. Legendary entrant Henry "Smokey" Yunick had circumvented the rules on fuel tank capacity by installing a fuel line between tank and engine with a diameter of about six inches. At the technical inspection he was told that there were nine things wrong with his car which needed to be fixed before it would be permitted on the track. Smokey drained and removed the fuel tank, told the inspectors "make that ten" and drove it back to the garage. Found this blog in an exhaustive and largely futile search for info about the daily happenings at the WHPSC. I have enjoyed it enough to follow the rest of your tour through our land. Thanks for the good work. You have inspired me to continue my own search for the best in ice melting equipment.